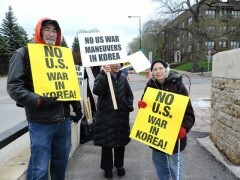 Twin Cities peace vigil opposes U.S. war on Korea | Fight Back! St. Paul, MN - The organizers of a weekly peace vigil in the Twin Cities issued an urgent last minute appeal for people to join their vigil on April 26 to make a statement against the growing danger of U.S. war in Korea. The organizers responded to the news that the Trump administration had invited all 100 U.S. Senators to a White House briefing on Korea. "It just sounds ominous, the White House bringing the U.S. Senate to hear from the generals and those threatening war, we just saw a need to make an anti-war statement," said one of the organizers. News reports have also said that the USS Vinson, a nuclear-armed aircraft carrier, is on the way to waters off Korea with a U.S. Navy strike force and two Japanese destroyers. The weekly vigil, held on the Lake Street-Marshall Avenue bridge over the Mississippi River, speaks out against U.S. interventions around the world, and has been ongoing since the U.S. war in Yugoslavia. The vigil often provides a vehicle to respond to U.S. war threats around the world. The vigil is sponsored by the End War Committee of Women Against Military Madness and the Twin Cities Peace Campaign. Groups that responded to the appeal to speak out against war in Korea included Anti-War Committee, Minnesota Peace Action Coalition and Veterans for Peace. Organizers issued a statement that said, "President Trump has already demonstrated through the Tomahawk missile attack on Syria and the use of the massive MOAB bomb in Afghanistan, along with other escalations of military intervention in Iraq, Syria, Yemen, Somalia and elsewhere, that he is more than willing to use force." The statement went on to say, "For North Korea, the years of massive U.S. military maneuvers can only be seen as a threat. North Korea (DPRK), through its rocket and military development programs, has been acting in response to U.S. military exercises on its border that simulate nuclear attacks and assassination campaigns. "North Korea has said it is willing to stop testing missiles if the U.S. stops its military exercises. The U.S. must negotiate, not escalate!" the statement concluded. Organizers announced that the vigil next week will also be focused on speaking out against U.S. war in Korea. In addition, it was announced that there would be an anti-war contingent in the Minneapolis May Day march and rally. The contingent, initiated by the Anti-War Committee, will included opposition to U.S. policy in Korea.